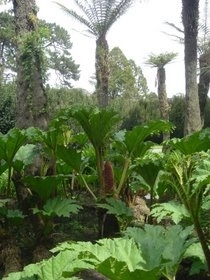 Gunnera tinctoria and tree ferns in Golden Gate Park. (Older synonyms are G. chilensis and G. scabra). 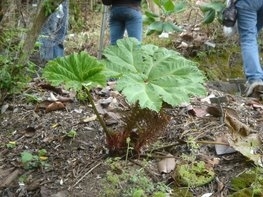 Charles Darwin, when exploring the island of Tanquil (part of modern Chile) in 1834, noted the "noble" Gunnera. 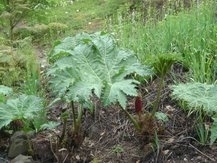 "I one day noticed, growing on the sandstone cliffs, some very fine plants of the panke (Gunnera scabra), which somewhat resembles the rhubarb on a gigantic scale. These are also sometimes called "poor-man's parasols" because the large leaves can be used as umbrellas, especially those of less deeply lobed species such as G. insignis (syn. 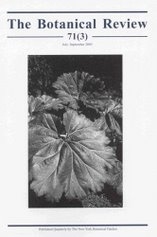 G. killipania), featured recently on the cover of The Botanical Review. This photo was taken in the Berkeley Botanic Garden in 1994/95. 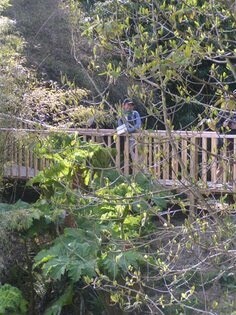 The photo below shows an offshoot of this plant in April 2007, with smaller early spring leaves and flowers. For an excellent photo of G. insignis in its natural habitat in Costa Rica, see this, from Wikipedia commons. Some species in this genus are now regarded as invasive plants in mild temperate regions, and naturalized populations are reported from New Zealand, Australia, Ireland, Cornwall and parts of coastal California around the San Francisco Bay Area. Nevertheless they remain a popular and impressive garden plant, especially the similar G. manicata (larger leaves) and G. tinctoria (smaller leaves and more succulent inflorescences), see e.g. here, or here, or here. 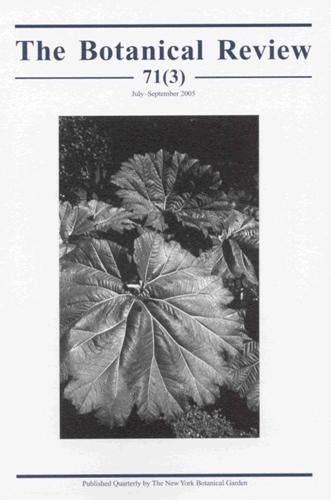 For the impressive Gunnera petaloideaof Hawaii see thee photos from Dr. G. Carr, University of Hawaii. A range of other Panke photos can be found here.